Loblolly pine is the most common timber species in the southern United States. This is due to the tree’s ability to grow rapidly on a wide variety of sites. It is considered a medium- to large-sized tree with an average height of 90 to 110 feet and an average diameter of 24 to 30 inches at maturity. In rare instances, the tree can live up to 300 years, but it normally reaches maturity at around 80 years. A common misconception is that loblolly and other southeastern pines create poor wildlife habitat. 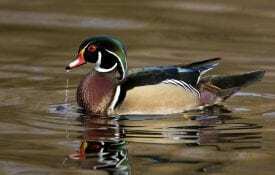 In particular, many believe that common game species, such as wild turkey and deer, prefer hardwoods. 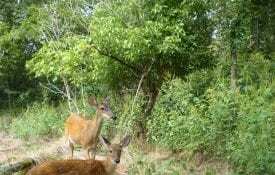 However, any properly managed forest—both pine and hardwood—can provide excellent food and shelter for a variety of game and nongame species. Land managers with newly planted pines know how valuable they are to wildlife. Ample sunlight around the planted pines allows native plants, such as green brier, blackberry, and ragweed, to grow. These plants will provide cover not only for game species, such as deer, turkey, rabbit, and quail, but also for nongame species, such as songbirds. Over time, the forest canopy begins to close and sunlight no longer reaches the forest floor. The lack of sunlight suppresses growth of native plants, and they begin to disappear. Closed canopy loblolly forests like the one in figure 1 offer little food and shelter for native wildlife. Depending on the site, crown closure usually occurs after 10 to 15 years of age. As crown closure occurs, the loblolly trees also become crowded, and their growth rate is greatly reduced. However, canopies can easily be re-opened with thinning, allowing sunlight to again reach the forest floor and create habitat for wildlife as well as increasing growth of the remaining trees. 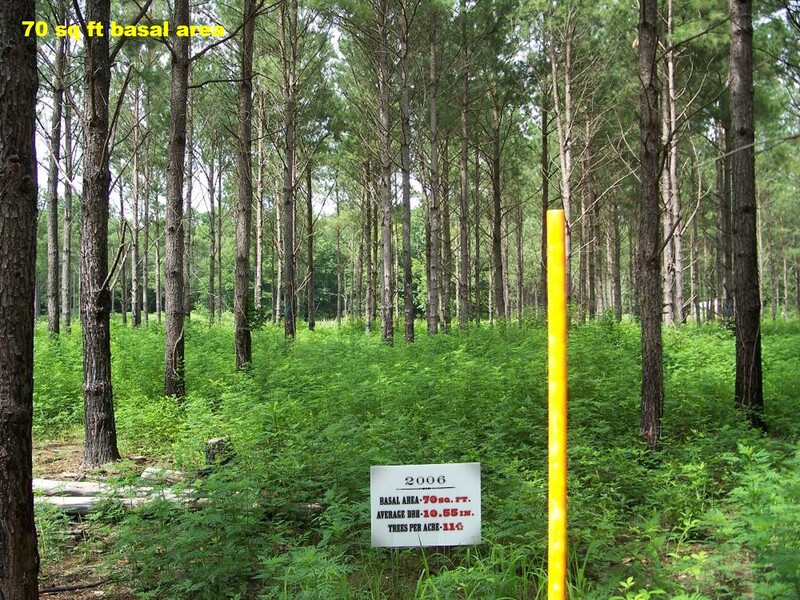 Typically, loblolly stands need to be thinned when the stand becomes so crowded that the growth of all trees is suppressed. Small trees dying in the understory is a sign of suppressed growth. Another way to determine if a stand needs to be thinned is by looking at the live crown ratio. 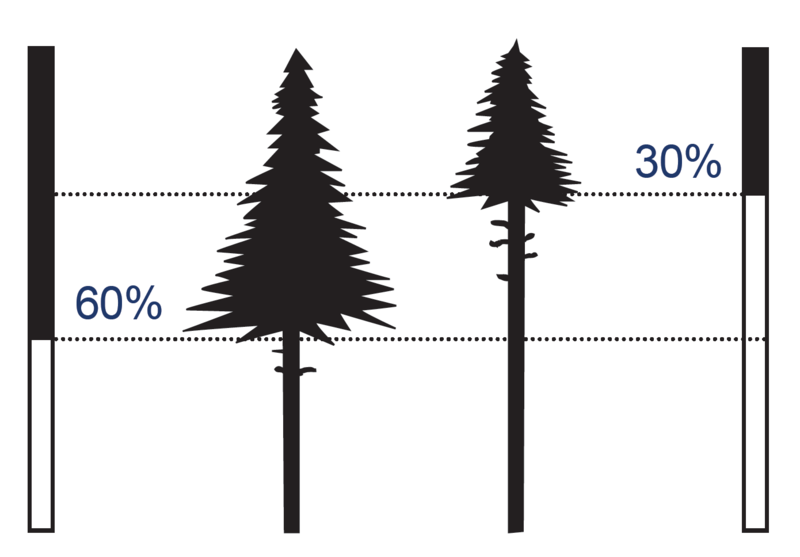 Live crown ratio is the distance from the lowest live branch to the top of the tree, divided by the total height (fig. 2). Loblolly trees show the best growth and vigor when the live crown ratio is greater than 40 percent. When trees start to approach 40 percent live crown ratio, it is time to thin. It is actually possible to wait too long to thin, as loblolly trees will not respond as well to thinning when live crown ratios are less than 40 percent. Figure 1. Once crown closure occurs, very little sunlight reaches the forest floor and native plant growth is suppressed. Tree growth is also greatly reduced because of competition. Figure 2. Calculating live crown ratio. During the thinning, land managers should place priority on removing diseased, deformed, and dying trees and leaving the best trees for future growth, harvest, and aesthetics. A loblolly pine stand typically has at least two and often three thinnings. 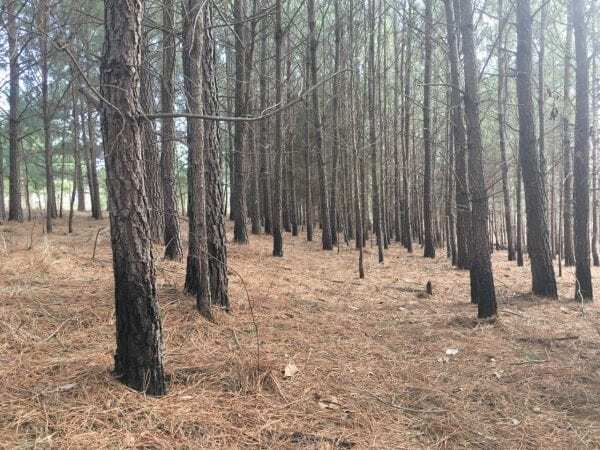 Normally, loblolly stands are thinned before the basal area reaches 130 square feet per acre and are thinned to a basal area of 60 to 80 square feet per acre (fig. 3). Once the basal area surpasses 130, crown ratios may not be high enough to respond to a thinning. If managing for a savanna-type habitat is a goal, stands can be thinned even more aggressively. However, thinning to a basal area of 50 square feet per acre or less can make the stand more susceptible to wind throw. Figure 3. This stand has been thinnned to 70 square feet of basal area per acre. The sunlight reaching the forest floor has encouraged native forbs, such as ragweed, to grow. After a thinning, there are many options for managing a loblolly stand. By the time the trees are thinned, they have a thick bark that is tolerant to fire. Once the tree reaches 4 inches in diameter, it is safe to burn, especially on cooler days that produce smaller flame heights. Prescribed burns discourage competing hardwoods, such as sweetgums, and encourage native plants for wildlife. Quail and turkey respond best to burns at least every three years, which provide adequate cover for nesting. 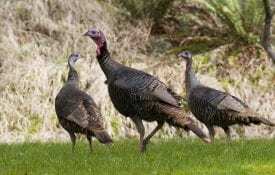 In particular, adult turkeys will forage in burned loblolly stands immediately following a prescribed fire. Deer will respond best to burning smaller blocks of land and providing a variety of burn intervals on the property. When managing with wildlife in mind, remember that a diversity of habitats will attract an array of different wildlife. Having different age classes of pines in close proximity will provide edge for many species. Edge is where two or more different plant communities meet. These areas increase diversity in both plant and wildlife species. When considering management options, remember that forests are constantly changing. To reach specific goals, conducting thinnings at appropriate times is vital, especially when managing for wildlife is a goal. Remember that pine stands are not poor wildlife habitat, but poorly managed pine stands are. Download a PDF Version of Thinning Loblolly Pine Stands To Benefit Wildlife & Timber Production, FOR-2054.